I'm pleased to announce that the book chapter 'Plans and speculated actions — Design, behaviour and complexity in sustainable futures' has now officially been published by Routledge Publishing. Design and sustainability are enmeshed. Many visions of a sustainable future assume large-scale changes in human behaviour, in tandem with scientific advances. A major component of this is design which relates to people’s actions: the design of products, services, environments and systems plays an important role in affecting what people do, now and in the future. This has become known, in recent years, as design for behaviour change, behavioural design, or in the case of specific focus on sustainability, design for sustainable behaviour. However, planning anything around human action is bound up with assumptions and – in the case of much work around design for behaviour change – determinism. Design which adopts a singular, linear vision of the future, and future human behaviour, does not deal well with the complexities of humanity, culture and society. How can we ‘plan’ for sustainability while embracing this complexity? Is it possible to use speculation and reflection to think through some of the potential consequences and side effects? In this chapter, we introduce questions that designers interested in futures, sustainability and people’s actions can use to explore speculative approaches to future human behaviour. As a cultivated form of invention, product design is a deeply human phenomenon that enables us to shape, modify and alter the world around us – for better or worse. The recent emergence of the sustainability imperative in product design compels us to recalibrate the parameters of good design in an unsustainable age. 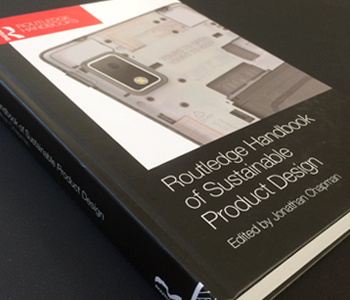 Written by designers, for designers, the Routledge Handbook of Sustainable Product Design presents the first systematic overview of the burgeoning field of sustainable product design. Brimming with intelligent viewpoints, critical propositions, practical examples and rich theoretical analyses, this book provides an essential point of reference for scholars and practitioners at the　intersection of product design and sustainability. The book takes readers to the depth of our engagements with the designed world to advance the social and ecological purpose of product design as a critical twenty-first-century practice. Comprising 35 chapters across 6 thematic parts, the book’s contributors include the most significant international thinkers in this dynamic and evolving field.